What is the difference between a turbocharger and a supercharger on a cars engine? Let's start with the similarities. Both turbochargers and superchargers are called forced induction systems. They compress the air flowing into the engine- (see How Car Engines Work for a description of airflow in a normal engine). The advantage of compressing the air is that it lets the engine stuff more air into a cylinder. More air means that more fuel can be stuffed in, too, so you get more power from each explosion in each cylinder. A turbo/supercharged engine produces more power overall than the same engine without the charging. 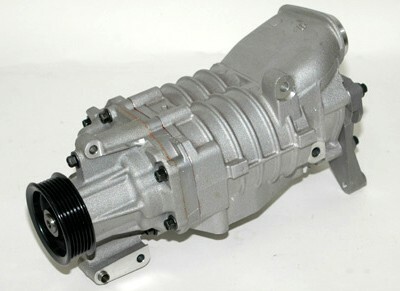 The typical boost provided by either a turbocharger or a supercharger is 6 to 8 pounds per square inch (psi). Since normal atmospheric pressure is 14.7 psi at sea level, you can see that you are getting about 50-percent more air into the engine. Therefore, you would expect to get 50-percent more power. It's not perfectly efficient, though, so you might get a 30-percent to 40-percent improvement instead. The key difference between a turbocharger and a supercharger is its power supply. Something has to supply the power to run the air compressor. In a supercharger, there is a belt that connects directly to the engine. It gets its power the same way that the water pump or alternator does. A turbocharger, on the other hand, gets its power from the exhaust stream. 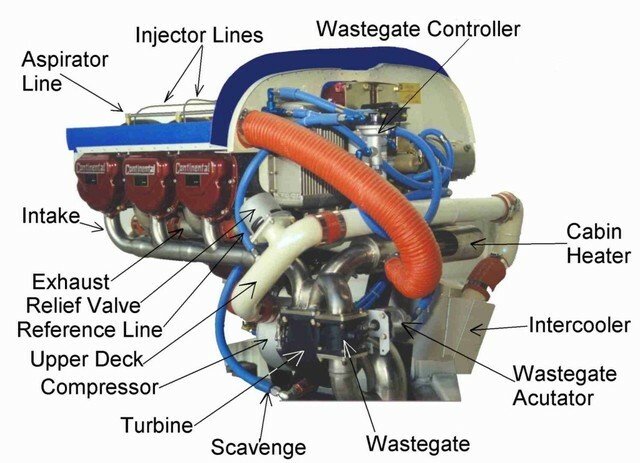 The exhaust runs through a turbine, which in turn spins the compressor (see How Gas Turbine Engines Work for details). There are tradeoffs in both systems. In theory, a turbocharger is more efficient because it is using the "wasted" energy in the exhaust stream for its power source. On the other hand, a turbocharger causes some amount of back pressure in the exhaust system and tends to provide less boost until the engine is running at higher RPMs. Superchargers are easier to install but tend to be more expensive.